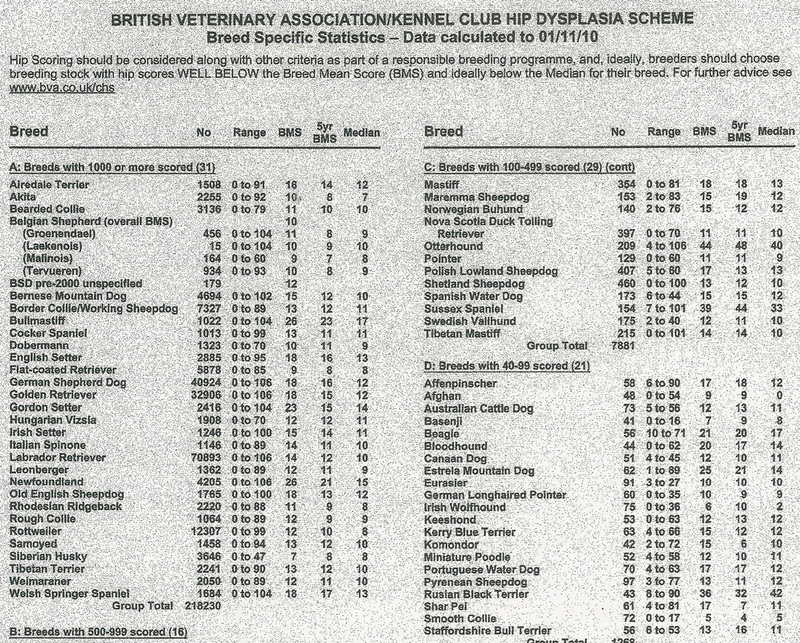 Genetics - that the condition is hereditary, so the best way to minimise the likelihood of a dog suffering from hip dysplasia, is to only breed from dogs with good hip-scores (please see below), or at least dogs with complementary scores. Environmental factors such as diet and exercise: there are those who believe that the condition is caused by poor diet and/or inappropriate amounts of exercise during the growth period. Further information on this can be found here. Another related cause could be obesity/being overweight. Vaccinations - some studies have found that vaccinated dogs developed antibodies to their own collagen. Further information on this can be found here. Before buying a puppy, ask your breeder to show you the hip-scores of the parents, and if they aren't excellent, ask them to explain their rationale behind using that particular dog. Feed a good quality raw diet (and if you suspect your dog is susceptible to joint issues, include cartilage-rich foods such as poultry feet, trachea, pigs' ears). Don't allow your dog to become overweight, thereby overburdening the joints. Minimally vaccinate (if at all). Of course, if you suspect that your dog is has a genetic predisposition to joint issues, the environmental factors become all the more important. There are various scoring systems for hips, but the one most commonly used in the UK is the British Veterinary Association method. Please find below the statistics in respect of Estrela scores in the UK at the time Missy was scored (you can see that as at 01 November 2010, only 62 Estrelas in the UK had ever been officially scored, with results ranging between 1 and 89, the average being 25). For an explanation of how hip-scoring works, please click here.